If there is plenty of native fruit and nectar up in the canopy, the bats do not need to feed on wild tobacco. If the climate is too wet or too dry the ticks cannot venture out of the leaf litter questing for blood. If the climate over the previous 12 months has been conducive to the 4 different life stages of the tick, the tick numbers are higher. There are potentially 5 or 6 choices of maternity campsites for the Spectacleds on the Atherton Tablelands during tick paralysis season. Most are in the higher altitude wetter parts of the Tablelands and one in the relatively drier part of Tolga. They will usually establish themselves at 2 or 3 of these campsites by the middle of October, and leave sometime after the babies are independently flying. Tolga is the exception, it is often permanently occupied throughout the year. There is a lot of wait-a-while (Calamus sp.) 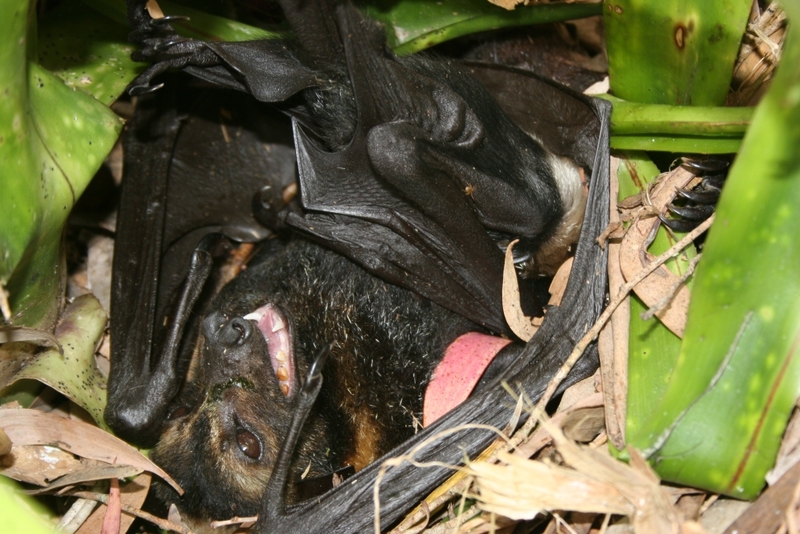 in the Tolga Scrub and paralysed bats often get entangled where usually they would not. If the bat has a good prognosis, we remove the tick immediately. The most common place to find the tick or ticks is around the head and neck. Tick paralysed mum, with bub, about to be injected with tick anti-toxin in the colony. If injecting on your own, the stick can help delay movement by the bat and prevent you being bitten. Most bats lie quietly and do not seem to notice the injection. Bruce and Ann Johnson identified the tick paralysis problem in 1990, though there were reports of unexplained deaths in 1986. 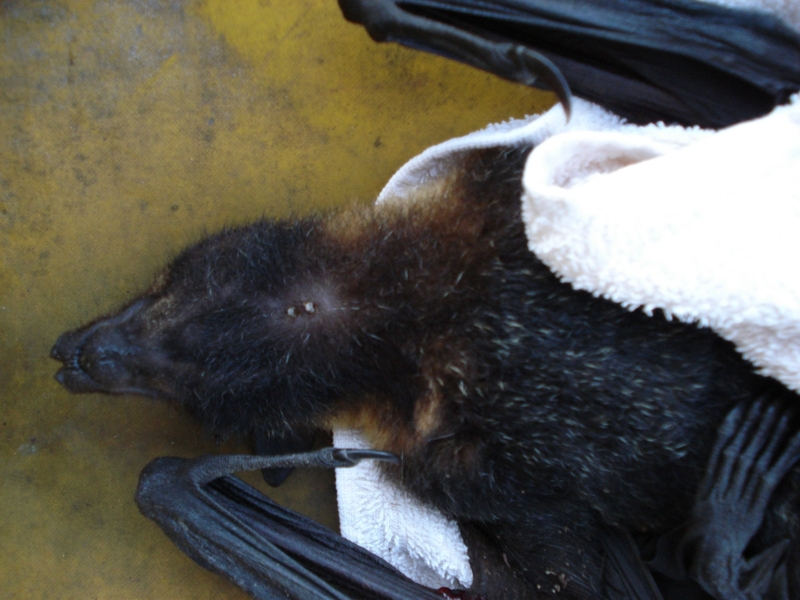 They set up the first bat hospital at Whiteing Road followed closely by Pam Tully at Zillie Falls in 1991 and lastly at Tolga by Jenny Mclean in 1997. 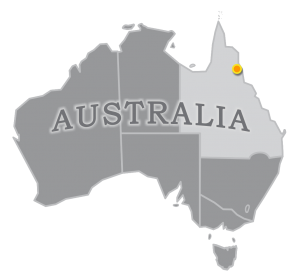 The 4 maternity camps in the wetter Tablelands were unoccupied from 1998 to 2002 and so the first 2 bat hospitals ceased operations. The flying foxes returned to Whiteing Road colony in 2003, but abandoned it again after Cyclone Larry in 2006. We did the searches in the intervening years, but in 2010 the SFFs set up a new camp on Malaan Rd, only about 1 km from the Whiteing Rd camp. This camp is now occupied every year with at least 20000 bats. 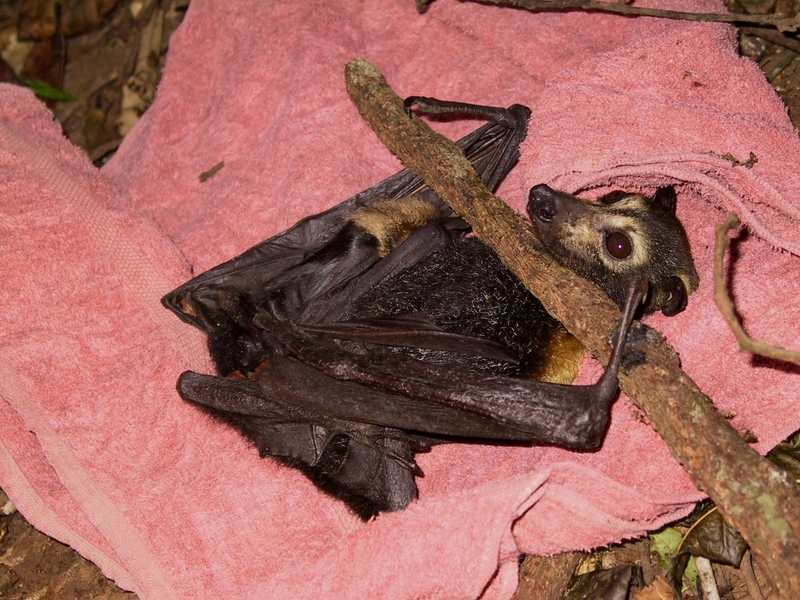 The Little Red flying foxes (Pteropus scapulatus) often camp at Tolga Scrub during tick season but are rarely affected, despite roosting lower in the trees. It seems the ticks are being picked up at feeding sites rather than roosting sites. 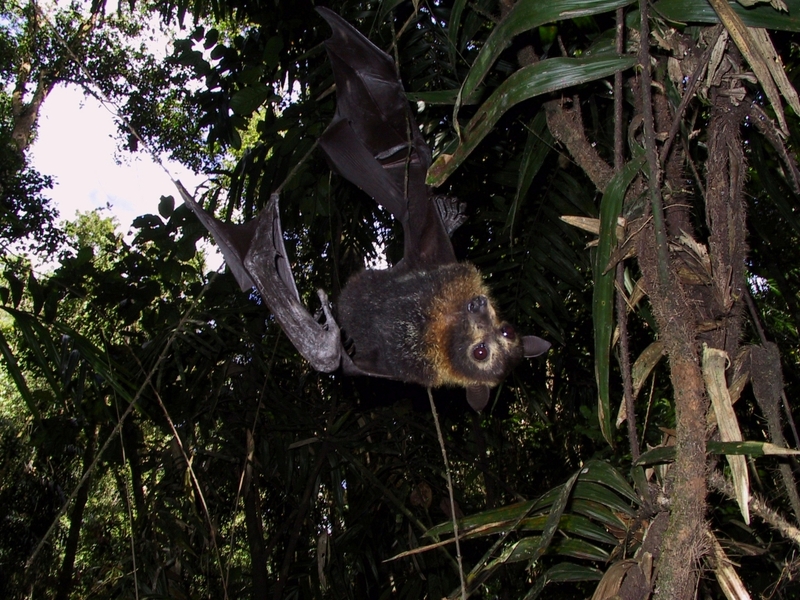 Cathy Eggert in her 1994 honours thesis titled ‘Is tick paralysis in the Spectacled flying fox related to a change in their foraging behaviour ?’ suggests that the ticks may be picked up in tobacco bush, Solanum mauritianum. An attempt by Peter Brice to prove this in 1997 was unsuccessful. Together with Dr Andrew Dennis from C.S.I.R.O we successfuly proved the relationship in 2001 with a grant from the Natural Heritage Trust. Many of the bats we find on the search are gasping. They have a poor prognosis. If you look closely, you’ll see an unengorged paralysis tick on the large pup’s upper arm. We usually find a few pups each year with tick paralysis. All pups coming into care need to be checked for ticks. It can be easy to mistake them for batflies (Nycteribids). We start opening up our tracks in the Tolga Scrub in September. This can be a lot of work especially if the Little Red flying foxes have been camping there in large numbers during the year as they cause a lot of branches to fall. There are always stinging trees and wait-a-while to avoid or trim back. We rarely encounter snakes, but often large Golden Orb spiders have made their webs across our tracks. It takes time to learn where the tracks are so that you know where you’ve been and where you haven’t been. The volunteer needs to be tolerant of large spiders and other wildlife as well as recognise dangerous plants. 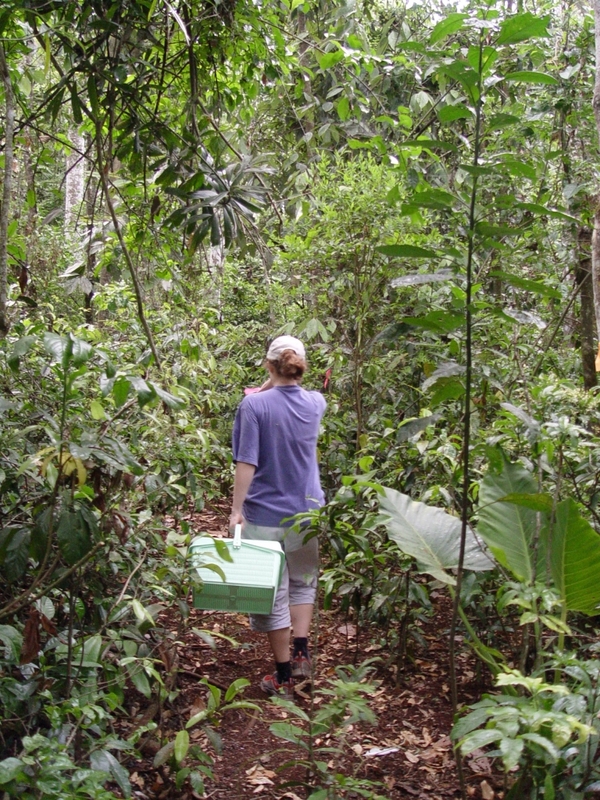 The volunteer needs to have good figure-ground perception to see the bat on the forest floor and selective hearing to hear the calls of the pups. Ideally the volunteer is capable and confident to handle a wild bat and remove the tick.